STURGIS, SD, February 5, 2018— The Sturgis® Motorcycle Rally™ has announced that it has been named a Preferred Qualifier for the World Food Championships at the inaugural Sturgis Burger Battle. The Sturgis Burger Battle being held during the legendary Sturgis® Motorcycle Rally™ will pit chef against chef in a burger cook-off located in the heart of downtown Sturgis, South Dakota. Right now, Sturgis® Motorcycle Rally™ is in a worldwide search to find the best hamburger grillers in the universe! Every chef, backyard baron, and restaurant thinks that they’ve got the best burger in their hometown. This is your chance to prove it! Twelve incredible teams will compete for a chance to be in the Grand Finale Burger Cook-off at the Sturgis® Motorcycle Rally™ this is all happening on the world-famous Harley-Davidson Stage in Downtown Sturgis during the 78th Sturgis® Motorcycle Rally™. The Sturgis Burger Battle will have a featured representative at the 2018 World Food Championships in Orange Beach, Alabama, according to Jerry W. Cole, Director of the Sturgis® Motorcycle Rally™. The event will send a winner from its 2018 competition to battle against the World Food Championships roster of Golden Ticket contestants. 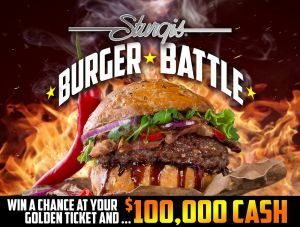 The Sturgis Burger Battle competition has been elevated to Preferred Qualifier status by guaranteeing that its winner’s registration fees are paid and other assistance is provided to compete in Orange Beach. “Stakes are high and the competition is intense with a total Sturgis® purse of $10,000 in cash and additional prizes, while the Sturgis® winner will have a chance at a $100,000 grand prize purse at the World Food Championships” Cole said. Competitors will prepare food on site in timed events that include preparation speed, specialty recipes, presentation and the ultimate test of taste. For more information on how to participate in the event, or event news head to www.sturgismotorcyclerally.com/burger-battle/ for more information and to register.